We understand that being without internet access in this day and age is like being cut off from the rest of the world. Have a look at our helpful advice below and if you have any questions or need some more advice, just give us a call and our friendly staff will help you get back online. Because each connection type is different, we have split our troubleshooting steps into the following categories. Please choose the connection type you need assistance with. If you are experiencing a problem with your broadband connection please carry out the following steps in the order given. This will give you the best chance of getting back online as soon as possible. 1) Please locate your Wi-Fi router, this could one of the models displayed below. TP Link (Left) Fritz!Box (Right). 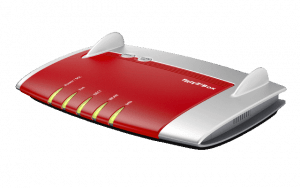 Your Wi-Fi router will have one port/slot that establishes the Internet connection. 2) There should be a cable connected into the WAN port on the back of the router. The TP Link routers have a Blue WAN port and the Fritz!Box routers use the yellow LAN1 port as a WAN Port. 3) Disconnect this cable and reconnect it firmly into the same port. Note – There is a small clip that needs to be pressed on the cable to disconnect it. 4) Follow this cable and it should lead you to a small black adapter. A white or Green light should be visible to inform you that power is running to it. 5) The cable that is connected to the WAN port on the Wi-Fi router should be connected into the LAN port or Gigabit Data port of this black adapter. 6) There should be a black cable connected into the POE port of this black adapter. This black cable should connect to the outdoor antenna to power it up. Please disconnect this cable and reconnect it. 7) Now unplug the black adapter from the wall socket, wait for the white light to disappear and reconnect it to the wall socket. 8) Finally, turn off your Wi-Fi router and then power it back on. Please wait 3-4 minutes. Now, check for internet access. If you are still offline and require assistance, contact our Technical Support team on 0669478811. Please note that our support line is open Monday to Friday 9am-5pm. 1) Please locate your Fritz!Box Wi-Fi router. 2) There should be a cable connected into the WAN port on the back of the router. Your Fritz!Box Wi-Fi router uses the yellow LAN1 port as a WAN port to connect to the internet. 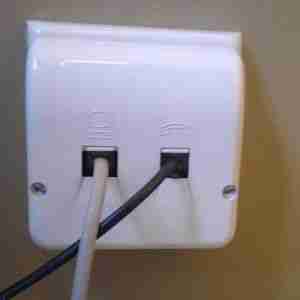 4) Follow this cable and it should lead you to a white plate on the Wall. This is known as the NTU. Make sure the cable is firmly connected to the NTU. 5) Reboot your Wi-Fi Router and wait 4 minutes. 2) There should be a cable connected into the WAN port on the back of the router. Your Fritz!Box Wi-Fi router uses the blue WAN port to connect to the internet. 4) Follow this cable and it should lead you to a white box attached to the Wall. This is known as the ONT and should have green lights dispalyed on it. The ONT is then connected to another white plate on the wall called the NTU. ONT (Left) NTU (Right). 5) Make sure the cable from the Wi-Fi router is firmly connected to the ONT. 6) Make sure there is power going to the ONT. There should be a green light on the ONT and the Power light should be lit green. 7) Check the cable is connected from the ONT to the NTU (Ensure the Fibre Optic cable is fitted correctly but do not remove this green cable). b) The PON light indicates the presence of the Optical signal coming from the exchange. Light should also be on. c) The LAN light demonstrates communication between the ONT and the Modem. Light should be on. e) PON Light Status: The ONT PON light should be steady green. If it is flashing green, Contact Ivertec. 9) If all green lights are displaying correctly then reboot your Wi-Fi Router and wait 4 minutes. 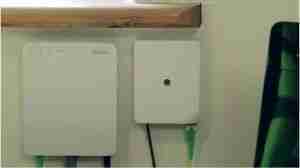 Have you checked to see if the issue is with your device and not the broadband supply coming into your home? If one device isn’t working but others are, then it may be a device issue. Check to see if Wi-Fi is switched on. Whether it’s on your Smartphone, laptop, PC, TV, or Games console the method is more or less the same. Go to Settings > Wi-Fi or Wireless Networks and check that your device is connected to your Wi-Fi network. If you can’t see your Wi-Fi network, make sure Wi-Fi isn’t switched off on your Wi-Fi router. On a TP Link router, there is a Wi-Fi On/Off switch located at the aback of the router. On a Fritz!Box router, the WLAN button at the top of the router switches the wireless radio On & Off. If the WLAN light on the front of the router is lit green then that means Wi-Fi is turned on.